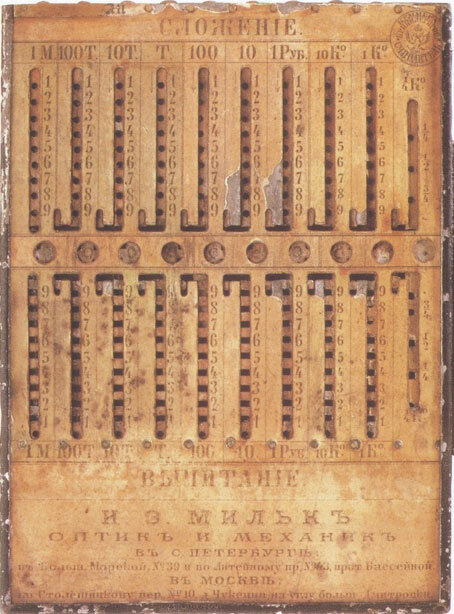 Several people experimented with versions of simple mechanical calculators, that involved strips of metal with numbers marked on them mounted in a frame, where a stylus was used to slide these strips up and down. A few names that usually rise to the top of the pile in this regard are Claude Perrault, who invented the first form of this class of devices (see Abaque Rhabdologique) some time around 1670, and César Caze, who created his version—nouvelle machine arithmétique in the beginning of 1700s. One problem with Caze’s machine was that it wasn’t possible to perform carries from one column to another. This issue was solved in 1840s (the first probably was Izrael Abraham Staffel (see calculating machines of Staffel) around 1845, then in 1846 by a german musician, working in St. Peterburg, Russia—Heinrich Kummer (see biography of Kummer), then by Billiard in Paris (Brevet d'invention N° 6703 from 1847) and others). The main principle of the construction Kummer borrowed from Slominski's adding device (in his first presentation Kummer mentioned the adders of Roth and Slonimski), which have already been presented to the Russian Academy of Sciences in St. Peterburg. 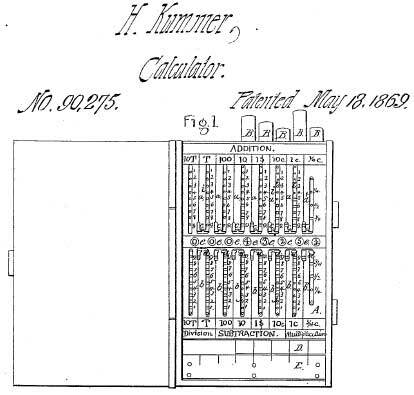 However this device, that went down in history of computer facilities as Kummer's Adding Machine, appeared to be considerably more effective, than the device made by Slonimski. 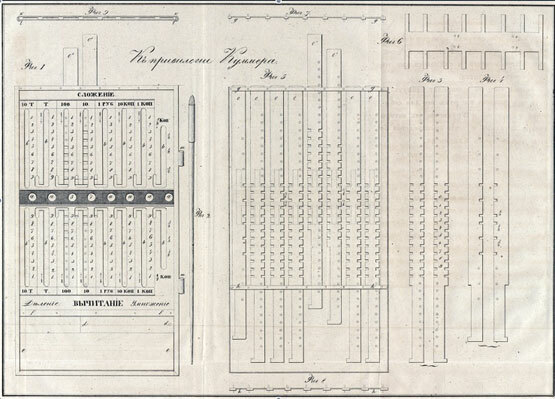 On 4 September, 1846, Kummer presented to the Russian Academy of Sciences his adding device. The reviewer on his device was the famous mathematician Mihail Ostrogradsky. In his review he noticed, that the main idea was borrowed from Slonimski, but the construction resulted was incomparably simpler and more convenient in use. 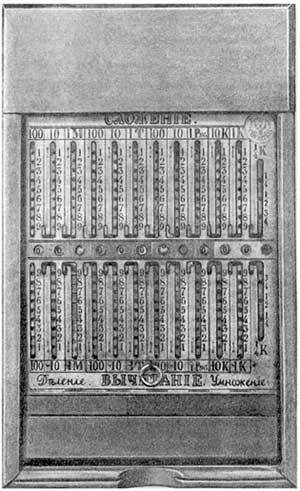 One of the major of advantages of Kummer's adding machine compared with Slonimski's device was portability. Ostrogradsky noted that to a sheet of paper folded eight times, would be as thick as this device, but the length and the width will be much more. With smaller sizes it would be inconvenient to deal with it. One of the early devices, kept now in the collection of CNAM, Paris, (see the lower image), is with dimensions 40 x 8,5 x 10,8 cm. Weight 95 g. Materials used are: cardboard, paper and ferrous alloy. The numbers are entered by means of stylus and laths, which can be moved along the troughs. At the side of the laths the numbers from 0 to 9 are marked. The carrying is done by means of teeth. Each lath has a tooth, which can touch the similar tooth on the adjacent lath and to move it 1 position upwards or downwards, if it is necessary. To reset the device all laths must be slided downward to the stop position, thus in all result windows will appear zeroes. The adding device of Kummer is first device of this type, manufactured in quantity. Kummer received on 29 March, 1847, a free patent (an extremely rare advantage) for his device for 10 years (Привилегия на счетный снаряд, выданная учителю музыки Куммеру, 29 марта 1847 года, на 10 лет). The device was produced by the firm Mechaniker und Optiker I. E. Milk (Мильк) in Moscow in significant quantity and later on was serially released (with various modifications) up to the 70s of the 20th century. Later, adders like Kummer's, for example the Arithmographe of Troncet, became very popular and were manufactured in millions until the advent of the electronic pocket calculator in 1970s. Some other devices of this type are examined in the section Gadgets of this site.